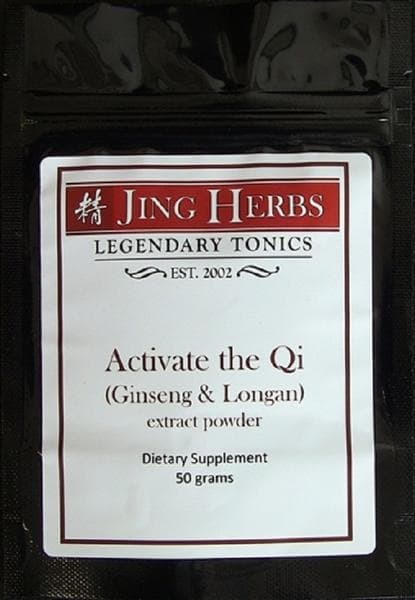 Ginseng & Longan is a formula that provides energy during the day and helps you fall asleep at night. It strengthens digestion, supports the building of blood, and has a calming effect on the emotions. The Spleen and Stomach are the organs that are responsible for generating blood by transforming the essences from food. When their function is compromised, the body has insufficient quantities of blood, leading to imbalances in the body, especially with the Heart. Heart blood deficiency can lead to anxiety, palpitations, and irritable sleep. The blood building herbs in this formula start with Longan fruit, which nourishes blood and calms the Spirit, and Dong quai, which tonifies and vitalizes the blood. Atractylodes macrocephala root, zizyphus jujube seed, euphoria longan fruit, astragalus membranaceus root, poria cocos sclerotium, panax ginseng root, dong quai root, zingiber officinale (dried ginger) rhizome, saussurea costus root, ziziphus jujuba (red jujube) fruit, polygala tenuifolia root, glycyrrhiza uralensis (chinese licorice) root. 2 gm (approximately 1 tsp) two times per day. Mix with warm water and drink as a tea. Add to smoothies or shakes if desired.